One of the most demanding climbs in professional road bicycle racing, Monte Zoncolan is a mountain in the Carnic Alps, located in the region of Friuli-Venezia Giulia, Italy. It has been used in the Giro d’Italia six times (2003, 2007, 2010, 2011, 2014, and 2018) and in the Giro Donne (Giro d’Italia Femminile, rebranded in 2013 as the Giro Rosa), once (1997). 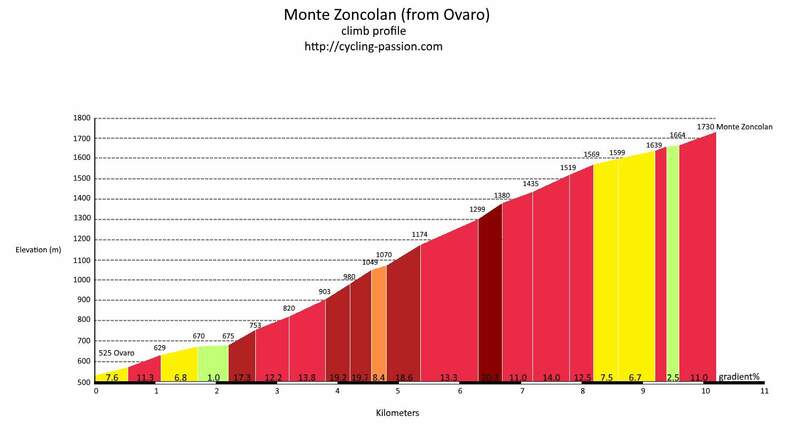 Monte Zoncolan climb profile (from Ovaro). From Ovaro, a comune (municipality) in the Province of Udine in the Italian region Friuli-Venezia Giulia, Monte Zoncolan ascent is 10.5 km long. Over this distance, you gain 1210 meters of elevation. The average percentage thus is 11.5%. Monte Zoncolan has been used in the Giro d’Italia five times, and four of them were on the “intimidating” side of Ovaro. It is widely considered to be the toughest climb in all Grand Tours. It usually has been compared with Alto de l’Angliru, first included in 1999 in Vuelta a España, a very steep mountain road in Asturias, near La Vega-Riosa, in northern Spain. But steepest, the 23.6-percent pitch of the Angliru is very short, and it is part of a kilometer stretch that averages “only” 17.2 percent. The grueling, lung-searing, leg-shattering 10.5 ascent from Ovaro to the top of Monte Zoncolan, however, has a kilometer of nearly 20%. May 22, Thursday. As soon as the steep part of the final, terrible ramp of Monte Zoncolan began, Gilberto Simoni (Saeco Macchine per Caffè) flew the coop and blew by Wladimiro Belli (Lampre). Behind, Stefano Garzelli (Vini Caldirola-Sidermec), Francesco Casagrande (Lampre) and Yaroslav Popovych (Landbouwkrediet) tried to keep the maglia rosa close, while Marco Pantani (Mercatone Uno) began his incredible, terrible march up Monte Zoncolan. Hands on the drops, his face contorted in agony, “Il Pirata” rode one of his finest races ever to pass Casagrande and Popovych and challenge Garzelli, but he faded in the last 200 meters where fast closing Casagrande and Popovych both caught him. Gilberto Simoni won the 2003 Giro d’Italia. May 30, Wednesday. After 39’05” of climbing at an average speed of 15.05kmh, Gilberto Simoni (Saunier Duval-Prodir) conquered the ascent of Monte Zoncolan for his second career win atop the terrible ascent, this time on the harder side from Ovaro. His teammate Leonardo Piepoli finished second at the same time with him. The 21-year-old Andy Schleck (Team CSC) was third at 7 seconds, while Danilo Di Luca (Liquigas) dumped Damiano Cunego (Lampre-Fondital) and came fourth at 32 seconds with the Lampre rider 6 seconds behind him. Danilo Di Luca won the 2007 Giro d’Italia. May 23, Sunday. The race to the top of Monte Zoncolan was a day of terrific racing. Once the peloton hit the first slopes, the Liquigas-Doimo team hit the front and started breaking legs, as we saw many times in this edition of the Italian grand tour. Michele Scarponi (Androni Giocattoli) was feeling good and hit the very reduced group of contenders with a hard attack. Then Ivan Basso dug deep and it was the end of the game for almost everyone but the world champion Cadel Evans (BMC) and Scarponi. Basso kept throwing high heat and first Scarponi had to relent and then near the top a grimly determined Evans had to concede. Basso won the stage and was now third in the general classification at 3min 33sec. The maglia rosa, David Arroyo (Caisse d’Epargne) managed to hold on to the Maglia Rosa for another day. Ivan Basso won the 2010 Giro d’Italia. May 21, Saturday. After protests from the riders and team directors (to Giro boss Zomagnan’s extreme fury), the UCI ruled that the difficult and dangerous descent of the Monte Crostis was to be removed from the day’s route. An ascent of the Tualis was the planned replacement, but after learning that tifosi angered over the removal of the Crostis were planning a protest on the Tualis, that climb was also removed. That decision was made while the race was in progress and shortened the stage length to 170 kilometers. 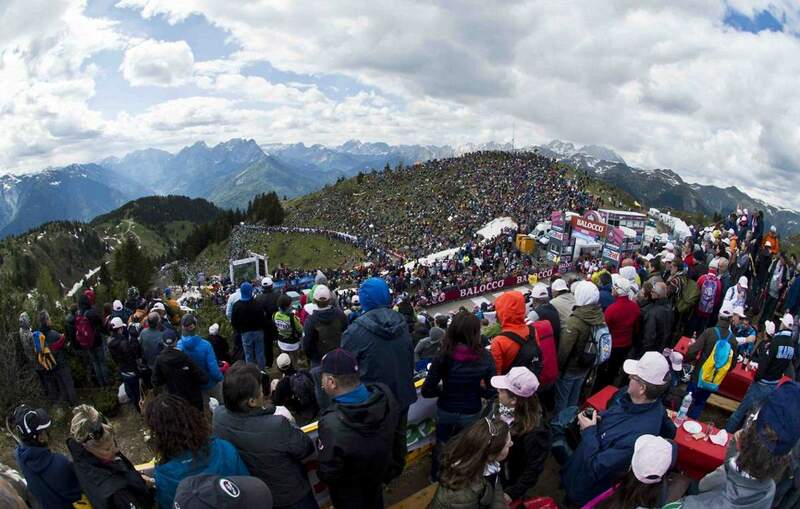 With the race shortened, the day’s breakaway made it to the start of the Zoncolan ascent. First Katusha’s Joaquim Rodríguez took off, then Igor Anton (Euskaltel-Euskadi) blasted away, the good racers all passing the earlier breakaway riders. Meanwhile, Alberto Contador (packing a 36×32 gear ratio for the Monte Zoncolan! ), with a nice time pad, was content to sit on Vincenzo Nibali’s (Liquigas-Cannondale) wheel. Anton won the stage and in the final meters, Contador left Nibali. Contador was still in the pink, red and green jerseys while Anton and Nibali are separated by only 1 second. Strong overall favorite Alberto Contador (Saxo Bank-SunGard) was the race’s original winner, in what constituted his second Giro championship. His winning margin ahead of second-placed Michele Scarponi was over six minutes. He also won the points competition as the most consistent high finisher, also with a substantial lead over Scarponi in second place, and Vincenzo Nibali completed the podium. In the other sub-classifications, Stefano Garzelli won the mountains competition and Roman Kreuziger finished as the best rider aged 25 or under in the general classification; he finished the race fifth overall. In February 2012, the Court of Arbitration for Sport decided that Contador, following his positive test for clenbuterol at the 2010 Tour de France, lost his results since that event. He was therefore stripped of the 2011 Giro title, and Scarponi became the new victor of the race and the winner of the points classification. May 31, Saturday. Michael Rogers (Tinkoff-Saxo) attacked out of a very early break to win at the top of Monte Zoncolan. Enthusiastic fans on the slopes of the Zoncolan interfered with many of the riders, particularly Francesco Bongiorno, who was riding with Rogers until an over-eager tifosobrought him down. Nairo Quintana, the Colombian rider of Movistar team won the 2014 Giro d’Italia. May 19, Saturday. The first action of Zoncolan saw 2011 winner Igor Anton (Dimension Data) attacking at the beginning of the climb. Anton is the only Monte Zoncolan stage winner still actively racing. He attacked not to win, but to honor the climb, to say everyone “I am here, with the favorites”. When the climb started hurting the legs, Michael Woods (EF-Drapac) attacked. Like Woods said, Wout Poels (Team Sky) pulled at the front of the peloton and brought him back. With 4.3km to go, Poels was done and his team leader Chris Froome launched a powerful attack. Behind him, a chase group of Domenico Pozzovivo (Bahrain-Merida), the pink jersey Simon Yates (Mitchelton-Scott) and Miguel Ángel López (Astana) has been formed. A few seconds back, 2017 winner Tom Dumoulin (Team Sunweb) was chasing that group with Thibaut Pinot (Groupama-FDJ) on his wheel. In the closing kilometers, Yates dropped Pozzovivo and López and started closing the gap between Froome and himself. In the last kilometer, it seemed like Yates is going to catch Froome, but somehow Froome found an extra source of energy and managed to win the stage atop Monte Zoncolan just six seconds ahead of Yates.